Now that I've got an entire semester as a working mom under my belt, I feel like I've really found my groove. 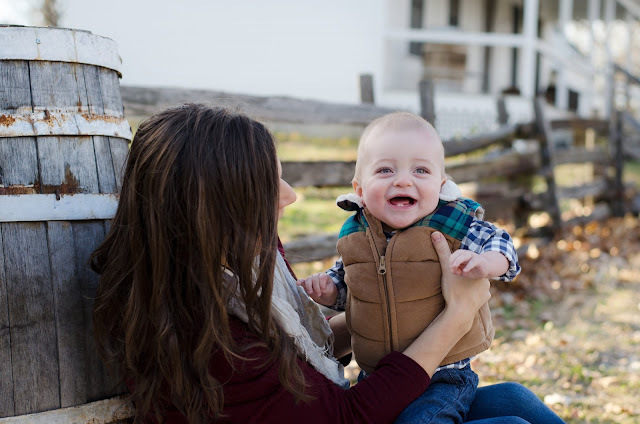 Not that I still don't miss my sweet baby while I'm at work (that will never change), but I've figured out the best ways to maximize the time I DO have with him: cherishing each and every sweet second. Being a mom is the best: but I've found that I still do have to make time for myself every now and then- it keeps me refreshed and rejuvenated in order to be my very best for myself, my husband, and our little man. 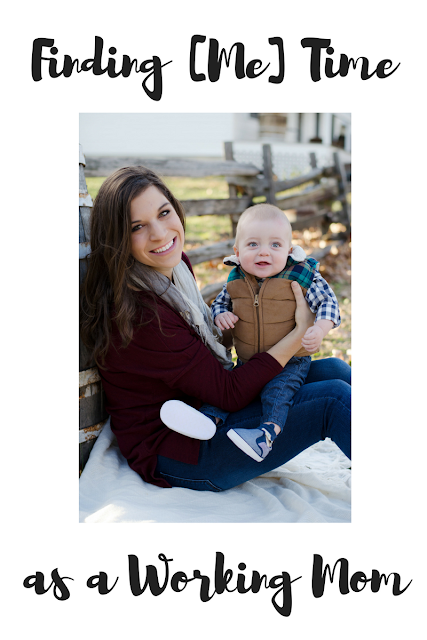 Here are some tips for finding "me" time as a working mom. By the time you get home from work, it can be SO hard to squeeze in a workout or a healthy without giving up time with your family. Be as strategic as possible, and make it a priority. Maybe you go for a quick 30 minute walk on your lunch hour. Maybe you squeeze in a quick workout before grabbing your kids from the babysitter, or take your little one along on a jog. Or maybe, like me, you run on the treadmill while watching Netflix after the baby is in bed. This way you can see your baby when you're home, but also get those steps in. As much as you may or may not like working out, it's so important to make it a priority, and it helps reduce stress, keep you fit, and keep you healthy. 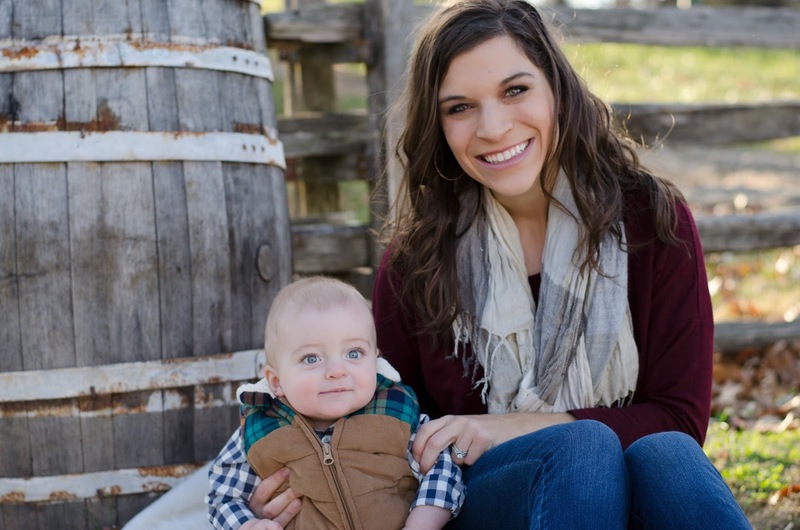 As a mama who has gone through pregnancy, childbirth, and lots of sleepless nights, it can be hard to feel beautiful. Of course true beauty is on the inside, but it's nice to feel beautiful on the outside too. Figure out what makes you feel beautiful, and then find a few minutes to do it! Maybe it's working out, putting on some lipstick, or simply washing your face with a fancy face mask at night. Maybe you love touching up your nails, wearing cute pajamas, or putting on a pretty pair or earrings. It may be whitening your teeth with the free kit you can win at the bottom of this post. No matter what you choose, rock it and feel the positive vibes- you beautiful lady! Make time for you by multi-tasking as much as possible. Cook meals in the crockpot on warm all day. Run the dishwasher and the washer while playing with your baby. And whiten your teeth while doing all of the above! 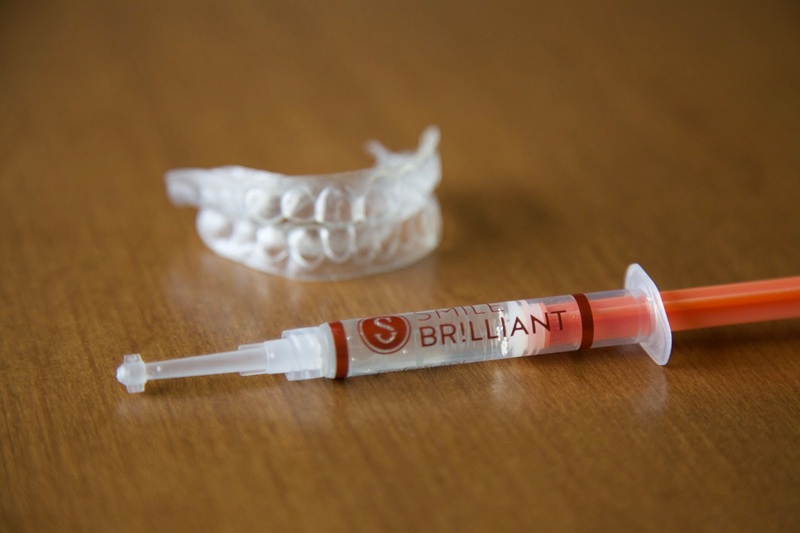 I recently used Smile Brilliant to whiten my teeth, and I am in love! Their teeth whitening kit is such a great, easy product to use. I made my own teeth impressions following their easy instructions, shipped them in using the provided mailer, and then they sent me back custom trays that fit my teeth exactly (small tooth gap and all)! Then I just put the whitening gel into my trays, and popped them in for 45 min - 2 hrs. If I needed to follow it up with desensitizing gel, I could do that too! 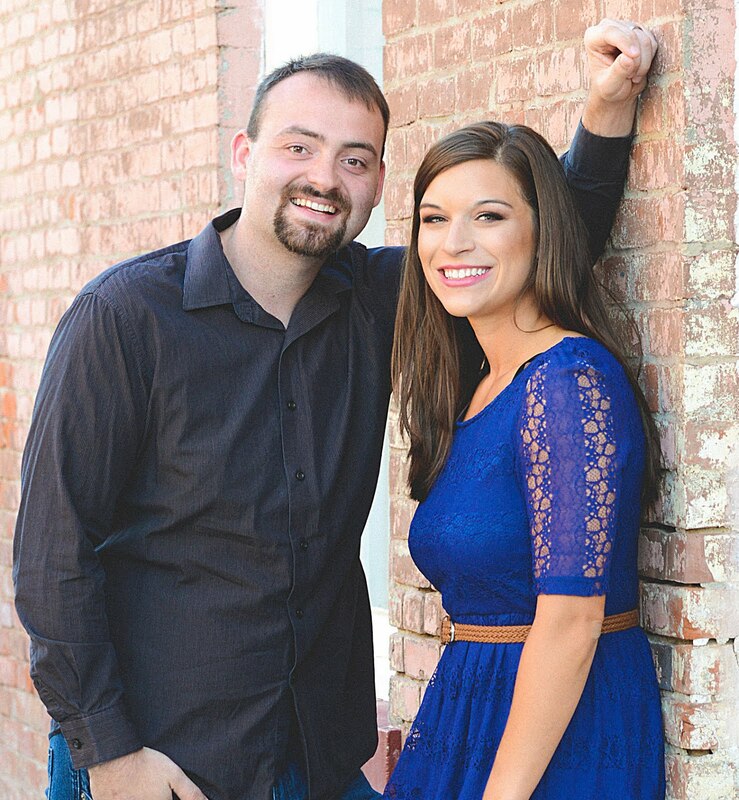 I was able to whiten my teeth while running, showering, cooking, playing with Eli, and more! I love that I was able to feel a little more beautiful and make time for me without having to mess with strips that fell off of my teeth or made me drool. And it's so reasonably priced compared to expensive treatments elsewhere! 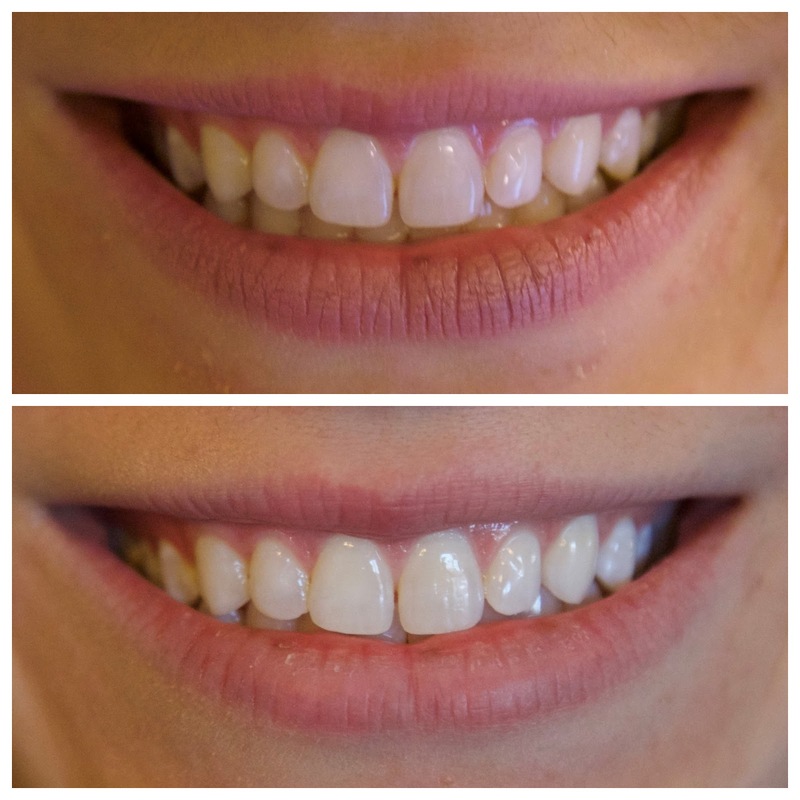 Here are my before and after results, and I still have some more gel that I can use whenever I feel like I need to whiten again! I really see a difference, and love whitening right before big events like weddings and family photos. And since I already have the fitted trays, I can even order more whitening gel at a great price and continue to whiten. Just make sure you use the product before bed so you don't introduce new stains. If you have any questions about Smile Brilliant, check out these FAQ answers, or feel free to comment below. You can also enter to win your own tray!! Mom guilt is a real thing, y'all. But we have to let it go. We have to understand that sometimes the best way we can care for our babies is by taking care of ourselves. We shouldn't feel bad when we ask for help from a spouse, a sitter, family, or friends in order to take a little time for ourselves. So do it, and let the guilt go! While it can be incredibly hard, we've got to find time to let ourselves relax and unwind. We need to mentally care for ourselves, and that often means putting the phone down, turning off the TV, and diving into a good book, bubble bath, or even a conversation with a spouse or loved one. Take time each day to give yourself a little break and relax so that you're ready to take on the world the next day! How do you find time for yourself (especially as a mom)? Let me know in the comments below, and be sure to enter the teeth whitening giveaway! Enter the Giveaway for $149 Smile Brilliant credit! Giveaway is open for one week (closing on Monday, January 22nd), and is open to USA, UK, Australia, and Canadian Residents. If you just can't wait, or if you don't win, you can still get 15% off your order with the code currentlykelsie15 ! This post in in collaboration with Smile Brilliant. As always, opinions are 100% my own. Thanks for supporting companies who support Currently, Kelsie. its hard because you want to spend all your time with the kids if you aren't working. but filling up our own cup is crucial too! It is so very hard to find time for ourselves with all the stuff that us "mom" have to do. If we don't though, I think we would go crazy. I do all of these and try to remind myself that I deserve it when I feel guilty. YES!! It is so so hard to find the time, but we need it desperately (and so deserve it!). I used Smile Brilliant last year and I liked the results. I do need more whitening though! Finding me time is so important for me too! It's awesome! I need to do another round here soon. And yes, me too is SO important! Thanks for commenting! I usually wait until the kids go to bed. That’s when I have my “me time”. I also get up a few hours earlier in the morning! Me too!! It's hard for me to be motivated to run that late or early though. But it's worth it to be with them! All so true - and your baby is SO CUTE. 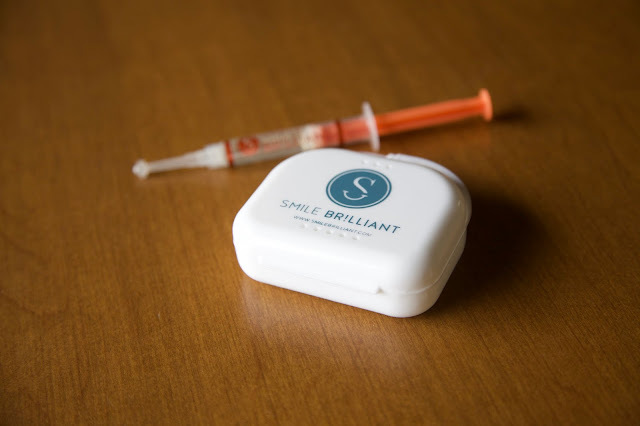 Love how Smile Brilliant worked on you! Thanks SO much, my sweet friend! I love it too! I love seeing pictures of your sweet little man!!! Thank you so much, Taylor!! I hope you had a great bday!